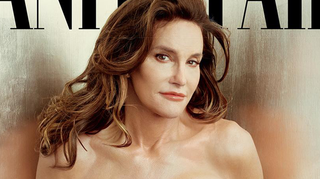 Brands, including MAC Cosmetics, are predictably pushing to sign Caitlyn Jenner on as a spokesperson. Caitlyn’s appearance on the July cover of Vanity Fair has piqued the interest of fashion and beauty brands that want her as the face of their company. The wooing reportedly started months prior to the cover reveal. Page Six ran into Estée Lauder group president John Demsey at the CFDA Awards Monday night at Lincoln Center, and he described Caitlyn’s Vanity Fair cover as “simply amazing, iconic, epic, disruptive, bold, glamorous,” adding, “There’s never been someone with that level of celebrity who’s ever done something so bold and so visible in public, and it’s done very elegantly and glamorously.” Demsey last year signed Kendall Jenner as the face of Estée Lauder. Page Six also refers to Caitlyn as “the talk of the CFDAs.” V.F.’s behind the scenes recap of the cover shoot shows how much prep went into making Caitlyn camera-ready, with a “glam squad” that included makeup artist Mark Carrasquillo, hairstylist Oribe and manicurist Deborah Lippmann. In the below preview clip for her E! reality show I Am Cait, which premieres July 26, Caitlyn says she’d never had a professional makeup job done until two weeks before the V.F. shoot and “what a difference” it makes.